Are there mountains in Kenya? Many people rather imagine scrub and grassland when thinking of Kenya, but in fact, Kenya is home to the two of the three highest mountains of the African continent. Nearly all of the mountains in Kenya are extinct or dormant volcanoes. The overall geography of Kenya is very diverse and ranges from rainforest along the coast, to the highlands of the Great Rift Valley. This is the highest Kenyan mountain. It's found in the central part of the country, about 100 miles north-east of the capital of Nairobi. Mount Kenya is made up of several distinct peaks, with the three highest being Batian, Nelion and Lenana. There are more than a dozen other named peaks besides these three. Batian is the highest and marks the elevation for Mount Kenya, at 17,058 feet (or 5,199 meters). On the African continent, Mount Kenya is second only to Mount Kilimanjaro, in height. Mount Kenya is surrounded at its base by the Mount Kenya National Park, which is a popular tourist attraction. The park is home to Colobus monkeys, buffalo and elephants. It’s possible to hike to the Lenana summit of Mount Kenya without mountaineering experience. The local Kikuyu tribe believed that their god, N'gai, lived at the top of Mount Kenya. After Mount Kenya, the second highest Kenyan mountain is Mount Elgon. It sits on the border of western Kenya and Uganda. It may not be the highest, but it has more than a few unique characteristics of its own. It has one of the largest calderas, or volcanic crater, in the world and the summit of the mountain is a flat-topped plateau of basalt. It has a height of 13,852 feet (or 4,155 meters). The mountain is pock marked with lava tube tunnels, which are a favorite spot for local elephants and buffaloes. The national park that surrounds Mount Elgon also has populations of eagles, rhinos, duikers, and leopards. Also a volcano, but rather a dormant one instead of extinct. It erupted last in the 1860s. Mount Longonot is 9,108 feet high (or 2,776 meters). The slopes are scarred with ridges, which gave the mountain its Masai name "Oloonong'ot", meaning "mountain of many spurs". The mountain and surrounding park has abundant wildlife, including herds of giraffe and zebra. It is only 60 kilometers northwest of Nairobi and easily reached by paved road. Unlike some of the other rocky mountains in Kenya, Mount Longonot is heavily forested including within the summit crater. The Namanga Hills are also known as the Ol Doinyo Orok mountain. One of the last remaining mist forest ecosystems is here, in the southern end of Kenya. Part of the mountain crosses the border into Tanzania. The peak is at 8,360 feet (or 2,548 meters). The Masai people live in the surrounding lands, and their hunting has had an impact on the wildlife populations here. Animals living on the Namanga Hills include antelopes, ostriches, hyenas and zebras. There is a national park there, but it is not one of the more popular parks with tourists. 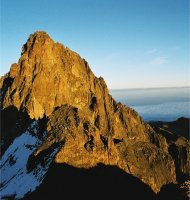 Other named peaks in Kenya are Menengai, Namarunu, Paka and Suswa. All four of these mountains are located the Great Rift Valley. 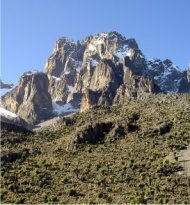 The mountains in Kenya are all popular destinations, and hiking tours are usually available through a travel agent for nearly all the summits. Not all can be scaled right to the peak without true mountaineering gear, but hiking or walking is usually possible at least some distance up the slopes. They can provide some of the most spectacular views of the Kenyan countryside.